The dangerous variety of scorpions capable of inflicting fatal stings are found not only in India, but the world over. The red scorpion (Mesobuthus Tamulus) is a deadly killer, claiming as its victims both adults and children. The enormity of the problem has been recognized since the 1960s, however there is no specific remedy available for potentially lethal stings from this species. 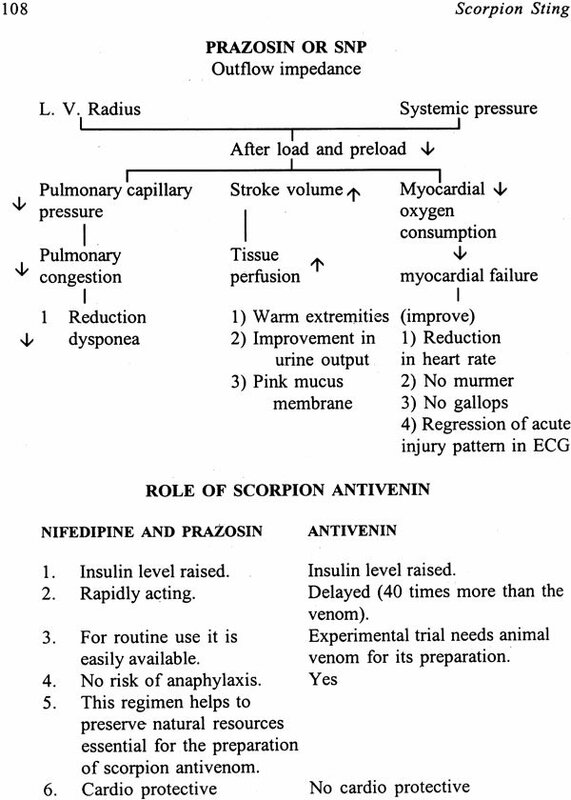 In the absence of antivenom, Dr. H. S. Bawaskar has applied the available knowledge on the pharmacological actions of scorpion venom to rationalize the treatment of life-threatening syndromes, particularly hypercatecholaminaemia, acute myocardial failure and pulmonary oedema. 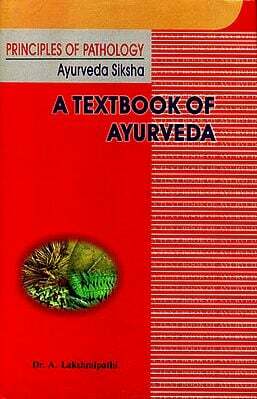 This book presents his work which complements much of the existing experimental data on scorpion venom and adds new information about the patho-physiology of envenoming in man. It depicts the author's efforts to arrive at a solution for scorpion envenomation. This book, a result of more than twenty years of research and clinical experience, is invaluable to all those concerned with the subject of animal venoms: pharmacologists, biochemists most of all clinicians and especially to those who strive to save lives. Dr. H. S. Bawaskar, born in Dehed, Maharashtra, completed his MBBS and MD from Nagpur and Pune and has had years of experience as a medical officer at primary health centers and the Poona Chest Hospital, Pune. He has dedicated his life to research on scorpion venom, in a rural area without special assistance from any external funds. He has published scientific research papers extensively in reputed national and international journals such as Lancet, British Medical Journal, Transactions of Royal Society of Medicine and Hygiene, Indian Journal of Pediatrics and has contributed to the Oxford Textbook of Medicine and Medicine Update. He has dedicated his life to experimentation and research on the subject of the fatal scorpion sting. His untiring efforts for more than twenty years have helped in arriving at a solution for the problem of life-threatening scorpion envenomation and resulted in a spectacular decline in the death rate. He has trained more than five thousand doctors in Maharashtra on the treatment of the scorpion sting at the periphery. 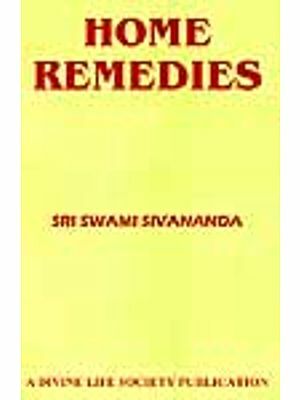 His work has received wide recognition in India and abroad, and he has participated in international and national seminars. Scorpion sting is a major medical problem in parts of both the Americas, North Africa and West Asia. In these areas fatalities are almost exclusively amongst young children, but in India, the red scorpion (Mesobuthus Tamulus) kills adults and older children as well. 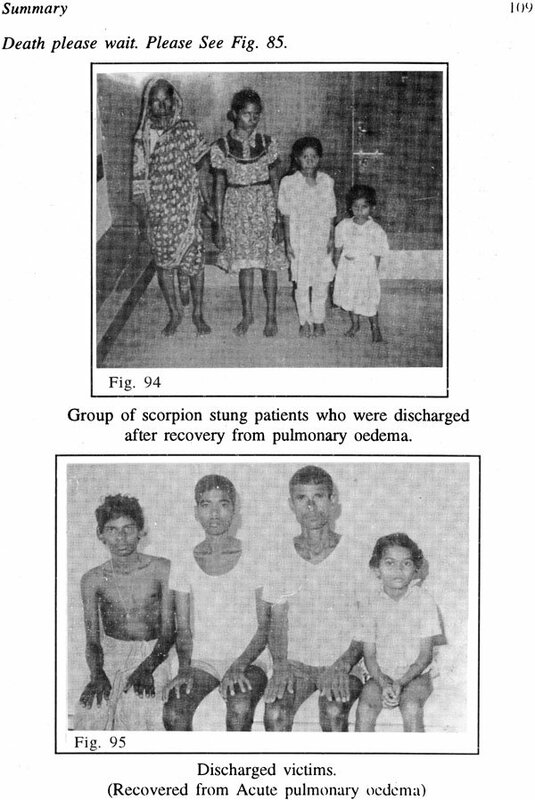 The problem in India has been recognized since the early 1960s, but surprisingly in a country which pioneered in use of antivenoms for snake bite, there is still no specific remedy available for potentially lethal stings by scorpions. In the absence of antivenom, Dr. H. S. Bawaskar has applied the available knowledge on the pharmacological actions of scorpion venom to rationalize the treatment of life threatening syndromes, particularly hypercatecholaminaemia, acute myocardial failure and pulmonary oedema. Like many pieces of brilliant clinical investigation, his studies of Mesobuthus Tamulus sting were not premeditated. 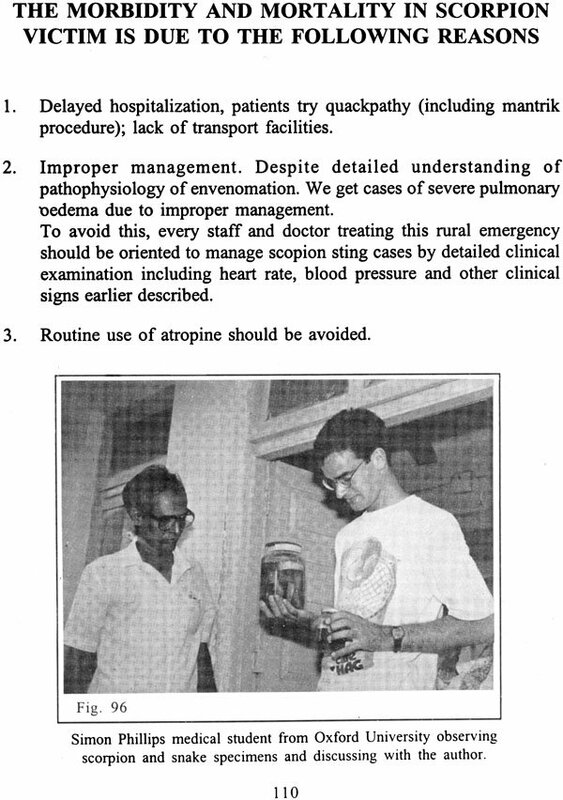 When he arrived in this rural endemic area in 1976, he was not aware of the problems, but responded with a series of inspired clinical studies which have progressively reduced mortality. 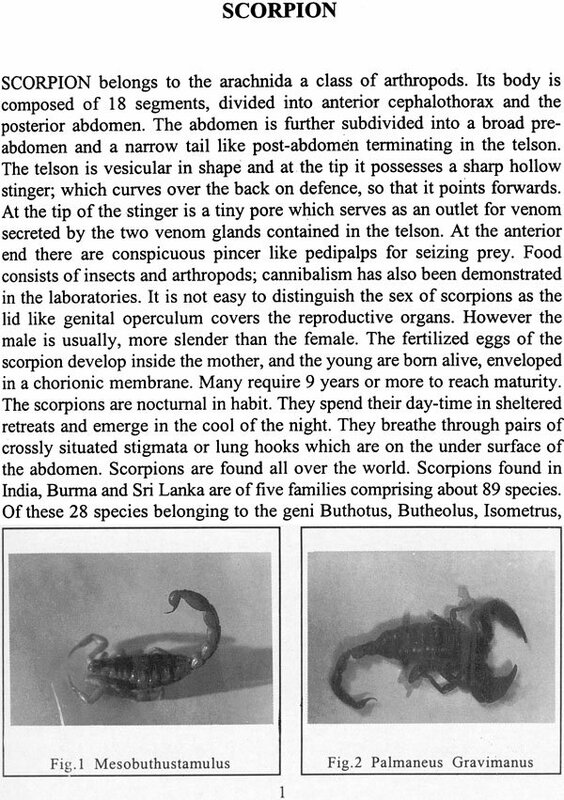 Dr. Bawaskar's work carried out under difficult conditions in the midst of heavy clinical responsibilities, deserves to be better known as it complements much of the experimental data on scorpion venom and adds new information about the pathophysiology of envenoming in man. 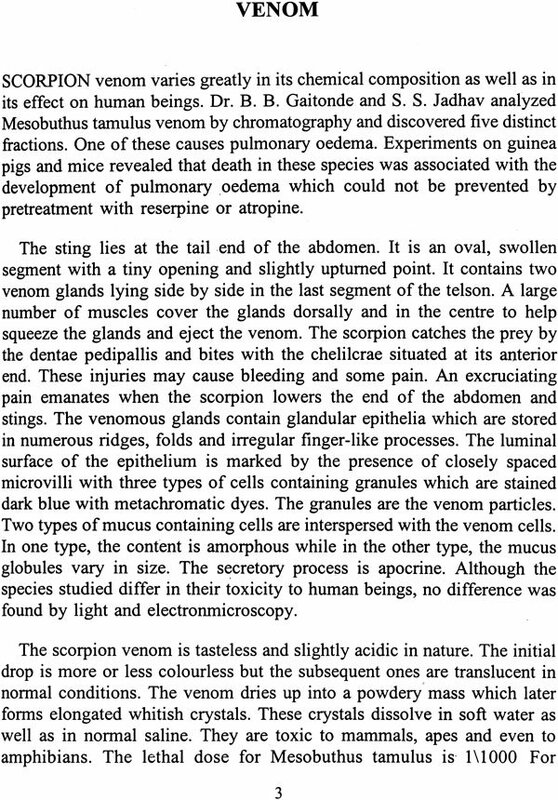 I have read the results of his 16 years, long work with interest and admiration, and recommend them to all those interested in the subject of animal venoms-pharmacologists, biochemists and most of all clinicians. In August 1976, I was appointed as a medical officer incharge of a primary health centre in Birwadi. Birwadi is a small village with a population of about 3,500 in Mahad tahsil, Raigad district, Maharashtra, 170 km south of Bombay. A day before I joined, a young daughter of a well known family had died of scorpion sting. 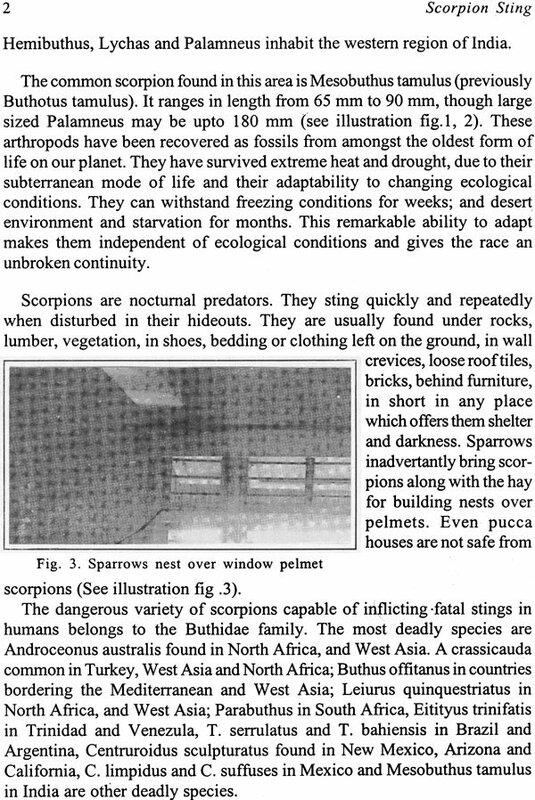 I was informed that several deaths occurred every year in the area as a result of scorpion envenomation. I paid the victim's parents a courtesy call and was informed that the girl, within an hour after the sting, sweated profusely, was breathless, brought out a reddish frothy fluid from her mouth and nostrils and despite treatment succumbed within three hours. However, she had no convulsions and was conscious till the end. Apparently, the girl died of pulmonary oedema. To study this grave problem, I decided to admit all scorpion sting victims at the centre. Though this dispensary was called a rural health centre, it was primary in the true sense, as it had no trained staff, laboratory facilities or medical equipment. I too was recently qualified and lacking in experience. 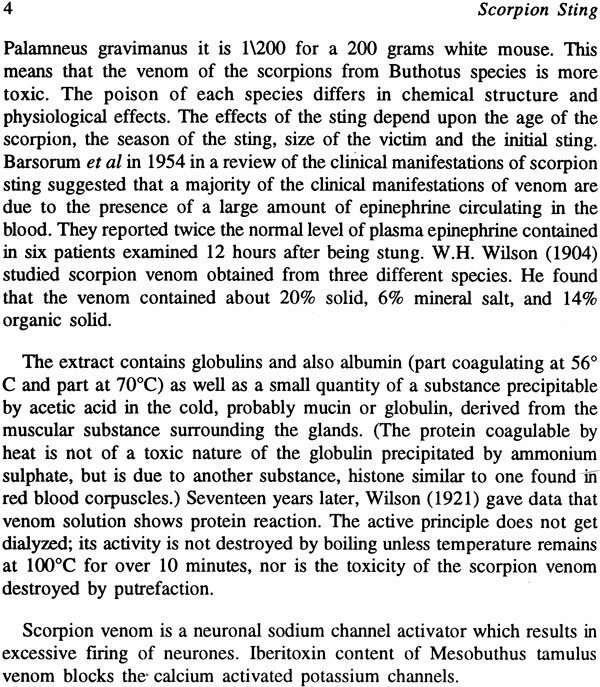 I treated the cases of scorpion sting showing cardiovascular manifestations with drugs like digoxin, diuretics, aminophylline, atropine, steroids, chlorpromazine, and antihistamines. A few cases recovered; but the serious ones showing arrhythmia and pulmonary oedema proved fatal. My knowledge and experience were inadequate to handle such acute medical emergencies and problematic cases. No senior physician was available for consultation within a radius of 100 kms. I personally accompanied three serious cases to the district hospital but no additional treatment was suggested or given to save the victims. My discussions with the professor of medicine at the medical college proved futile. It was news to many of them that scorpion sting could be fatal. Some had never set eyes on a live scorpion; I was downcast that I was no better than the general practitioners. Then one day I was informed that I had been selected for post graduate course. I availed of the opportunity to do a post graduation in medicine in Pune. After post graduation, I was fortunate to be posted at a rural hospital at Poladpur. Coincidently Poladpur is just 15 km away from village Birwadi, where death due to scorpion sting was still an unsolved problem. 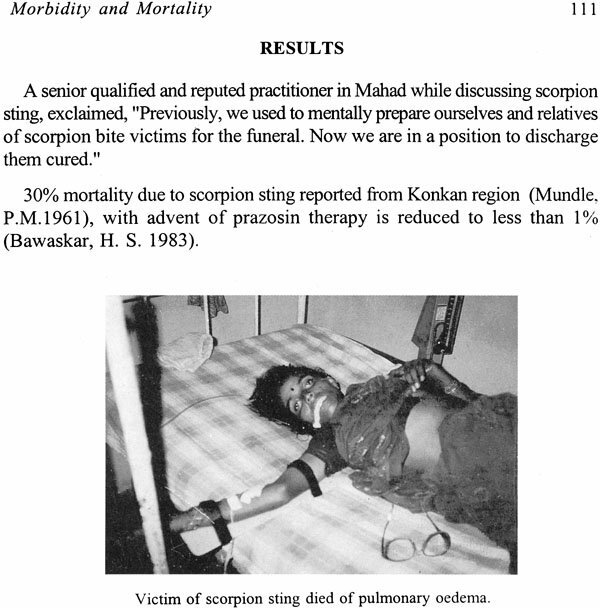 Dr. P. M. Mundle in a letter published in the British Medical Journal in 1961, reported 23 deaths (including 9 adults) due to scorpion sting out of 78 cases he had studied during 14 years from Goregaon in Mangaon Tahsil. This was a challenge which spurred me on to pursue my study of scorpion sting vigorously. This book is the outcome of my clinical study of over 600 severe scorpion sting cases over a period of 16 years.